This morning, Matt Moore was a highly touted rookie gearing up to make an unorthodox postseason debut. Having a career total of just one major league start, Tampa Bay Rays manager Joe Maddon surprisingly tapped Moore to lead the rotation in their series against the Texas Rangers. No matter how strong Moore was in the minors this year, it was a lot of pressure to put on a kid who started 2011 playing for a team called the Biscuits. Tonight, Moore is a hero. Giving up just two hits in seven innings, Moore dominated a potent Rangers offense and helped lead the Rays to a 9-0 victory. Moore's baseball cards have taken off. A week ago, his 2009 Bowman Chrome Prospects card was selling online for less than $3.00. Since the end of Game 1, they've tripled, at least for the time-being. Moore's 2009 Bowman Sterling baseball cards have also seen huge gains. Last week, they were selling on eBay for around $15. Now they're pushing $30 each. Yesterday, copies of his 2010 Donruss Elite Extra Edition autograph (/819) could have been found for around $50. Right now, you're looking at $90-100 to get one. I wonder if those sellers that closed yesterday kicking themselves right now? Interestingly, Moore doesn't have an official rookie card yet. Although his Bowman-brand cards from 2009 picture him in a Rays uniform, they're not fully licensed and are viewed by many as prospect cards. No matter what happens to Moore and his team for the rest of the postseason, it's safe to assume that when 2012 Topps Series 1 and 2012 Topps Tribute hit early next year, many are going to be chasing after the pitcher's official rookie cards in a big way. I sold a Lumbergraphs ITG /100 for $80 on COMC I had listed before the game and forgot to take down. Not a terrible price given ITG, but suspect it could have gone for more. That said, by the time I got it shipped and listed on eBay some of the momentum may have worn off. Still have a bunch of chromes and Extra’s. Santo (ID 26553) � I’d say $80 is a great price to sell for. You MAY have been able to get that on eBay or elsewhere but, as you mentioned, perhaps not. For what’s out of him right now, the prestige is in the 2009 Bowman stuff and 2010 Elite for autographs. 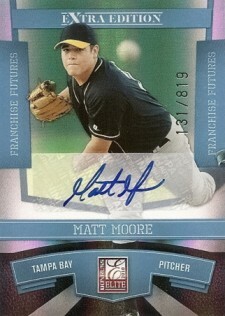 Everything else, at least to me, are simply early Matt Moore cards. That is until next year when his fully licensed rookies come along. This kid is the real deal. Had the fortune to see him pitch in Montgomery, AL. earlier this year, and there was no doubt he was going to be at the big club soon. Wish I had pulled the trigger and picked up some autos earlier.